Do you get overwhelmed when you walk up the spice aisle of the grocery store? Do you know how to use things like extracts and salts in recipes? Well the Virtual Potluck group has embarked on a journey and we'd like to take you along. We have partnered with the Savory Spice Shop and have cooked our way through every section of their store. Each of us focused on a different category...mine is extracts. We hope that by the time you are done reading all 12 of our posts you will have a better understanding and appreciation of spices and how they can be used to change the ordinary to the extraordinary when cooking. 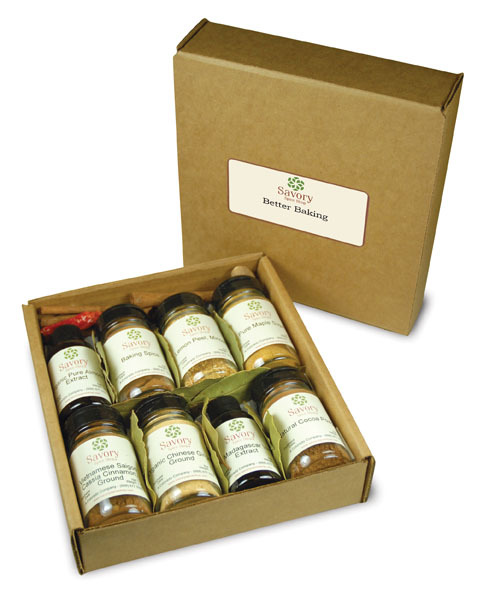 What is going to make this event even more fun for you is that each blogger is offering a cool Savory Spice Shop gift set from their specialty. That means 12 different gift sets, to 12 different winners. So be sure to visit the entire group. I guarantee you it will be worth it. Here's a look at what you can win...see below for details on how to enter. So let's get started....I told you my focus is on extracts. Why extracts? Well I love to bake and extracts are a way to enhance the flavor of baked goods without changing structure. So technically you can start with one basic recipe and by just switching out the extracts have a different product each time. 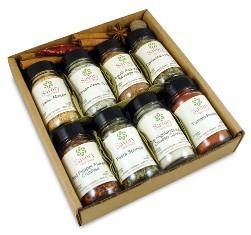 The Savory Spice Shop has a great line of extracts all of which are gluten free and contain no added sugar. They use only the best essential oils and naturals flavors and guarantee their extracts to be bake and freeze proof. Which means there's never a loss of flavor. When I started browsing through the extract section online I'll admit I was a bit overwhelmed...there is quite a large selection of flavors to choose from. So to make it easy on myself I decided to start with the finished product. I knew I wanted to do a cake sundae of sorts...and I knew that chocolate had to be involved. This helped a lot...I decided to randomly choose 3 flavors that would work well with chocolate and go from there. My picks: cherry, almond and pistachio. The first thing I did when my extracts arrived was taste them. This might seem odd but I needed to know what to expect before I could start using them. I was not disappointed. Each one of them had a very distinct flavor not chemically like some extracts i've tasted in the paste. I decided I was going to find a way to use all three in my recipe; and I did. That is how I came up with my spumoni sundae. It's layers of chocolate cherry cake and pistachio ice cream topped with almond whipped cream. In the bowl of a standing electric mixer, or by hand, beat together the butter and sugar about 5 minutes until smooth and creamy. Add the eggs one at a time until fully incorporated. Mix together the water, cherry extract and milk. Stir half of the dry ingredients into the butter mixture, then add the milk mixture. Finally stir in the other half of the dry ingredients. Pour 1 cup of the cream into a medium saucepan and add the sugar. Scrape the seeds from the vanilla pod into the saucepan and add the pod to the pot. Warm over medium heat, stirring, until the sugar is dissolved. Remove from heat and add the remaining cream, the half-and-half, and the pistachio extract. Chill mixture thoroughly in the refrigerator, for at least eight hours or overnight. Place your mixing bowl and whisk in the freezer for about 15-30 minutes. Then place all the ingredients in the cold bowl and beat until stiff peaks form. Using a cookie cutter the size of your cup cut pieces of chocolate cake and pistachio ice cream. Save the excess for another use. Press cake and ice cream into glass. Gently pipe whipped cream on top. Garnish with crushed pistachios if desired. Great post and so so delicious! Wish this wasn't a Virtual Potluck! Looks awesome Theresa. I love the Spumoni idea. Yum!! Looks great Theresa. Love it!! I'd like to try raspberry extract. I would love to try the key lime extract. I posted on the Groovy Foodie's blog. I commented on Rachel Cooks. The spumoni sundae looks really delish. The spumoni looks amazing. I know my husband would hoard this - he's a huge pistachio fan! I took a look at the extracts and I'd love to try raspberry and lavender extracts. First: your sundae looks delicious! Cherry, almond and pistachio are three of my favorite things. Throw in chocolate, and you have a home run! Next, to answer your question, I'd like to try their almond extract. I always seem to keep running out of almond extract. As I said, your sundae looks like a home run to me! Pistachio ice cream sounds so great! Paired with chocolate? Awesome. I liked the Savory Spice Shop on Facebook. I commented on Rachel and Shelby's blogs. I followed Savory Spice Store on Twitter. OMG, that looks so good! I started the ice cream making season already and want to make an Indian pistachio kulfi ice cream! So I would use the pistachio extract for that. Then I would have to make an almond ice cream, too! Yum! The wonder of extracts! My father would be all over this. Looks amazing! Yum, I love everything about this dessert. Lovely! wow... yumm! and you mean to tell me there's such a thing as cherry extract. I need some pronto. chocolate + cherry, my favorite pair! i recently made cookies with pistachio and cherry but used white chocolate instead of regular. what a great combo! i commented on rachel cooks' blog! yum! I couldn't get the facebook page to work, so I went straight to the website. I would LOVE to try the key lime extract! I follow Savory Spice Shop on Twitter! I commented on Cooking with Books' post as well! I just about flipped when I saw Butterscotch Extract! Thanks for the info, giveaway and link! I also commented at Diabetic Foodie. Thanks! Oh I love those spices! You can never have too many! The rum extract - I would love to try that. I'm very sorry - there are multiple entries up there - I received multiple error messages that stated that I couldn't leave my comment! This is my "plain" comment entry. I liked Savory Spice Shop on Facebook. I liked Food Hunter on Facebook! I left comments on all the other blogs! I love spices. OMG. That sundae looks absolutely amazing. I'm going to have to try that pistachio ice cream recipe. I'd be interested in the natural flavor coconut extract. I think I would use this in a cookie recipe. 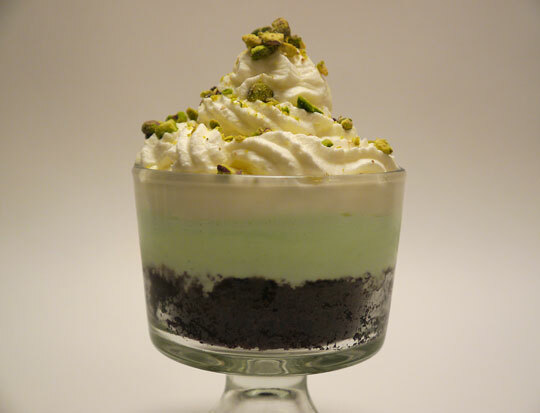 Your Spumoni dessert looks so good. Yum! I follow @SavorySpiceShop on Twitter. oooh, I've been playing a lot with ginger lately so I'd probably have to go with the ginger extract. I'd like to try the Madagascar Double Strength Vanilla. Your sundae looks divine, I could definitely eat it Monday thru Saturday and most of all on Sunday! I love your little "invention". Your Sundae sounds better to me than any I have ever had. I am a huge fan of all those flavors, chocolate, cherry, pistachio, almond......yum! I like Savory Spice Shop on Facebook. I've commented on the other posts and must say your food looks the best! I am following Savory Spice Shop on Twitter. I'm interested in the pistachio extract, especially the ice cream recipe above! Wow, this looks yummy! I would love to win some extracts. Thanks for the chance. After reading your blog and seeing the pics, I am starving! Great creativity shown in using all three extracts. The One I would like most to try is Madagascar vanilla bean paste. Imagine using that in homemade ice cream! I would love to try the organic lemon extract! I've been following Savory Spice Shop on Facebook for a while now! So many fun ideas. I would most like to try Natural Flavor Cherry Extract. It is one I have been meaning to try but just never have. It smells yummy! This is my second entry, leave a comment. This recipe looks great. I can't wait to try it. Cherry Extract sounds pretty good! Someone was lucky and got to try this spectatular looking dessert. I like theSsavory Spice Shop on Facebook. I commented on some of the other blogs. I commented on the Diabetic Foodie blog - I love curries! I also want to try the Maple Extract, it sounds very interesting. I love the way you incorporated the flavors into this amazing dessert! Yum!